Shells make ideal table weights and are elegant on a summer table. To make this easy and gorgeous table covering, weave pieces of jute in a basketweave pattern, leaving varying amounts of longer pieces on each end. For a sturdier "tablecloth," you may want to knot the basketweave pattern, too. I think that it looks better to scatter the length of the shells for a relaxed look. Tie the shells to the end of the jute. Shells are perfect for a dinner table or living room centerpiece. I use inexpensive glass containers from Michael's or A.C. Moore. This year, I'm going to fill the candy jar that I got from Sweets and Treats. 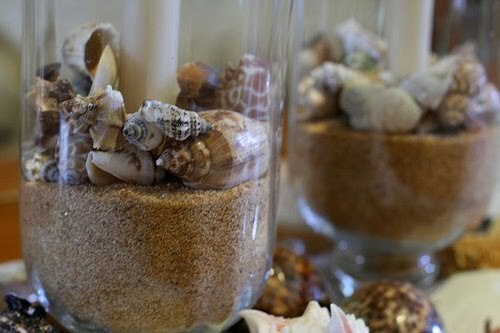 Even a small child can decorate with shells they have gathered. 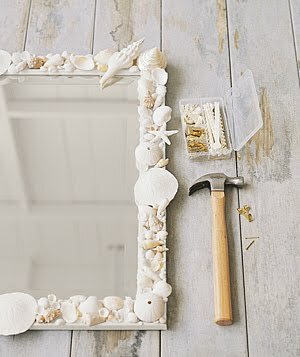 Paint a frame white and attach shells to it. What better way to display beach photos! Alternatively, add shells to a hallway mirror. Another fun way to use shells is as pinch pots. Since we have quite a few clam shells, they would make a serving dish for sauces, dips, salt, sugar, and other small condiments. There are so many ways to use and share your shells. It will be a fun way to remember the beach. At one point, so many shells were washing up to the shore that Alexia put her hands down in the sand and would catch the shells! I've never seen so many perfect, non-broken shells washing up to the shore. Do you decorate with shells or use them for a practical use at home? How do you use them? 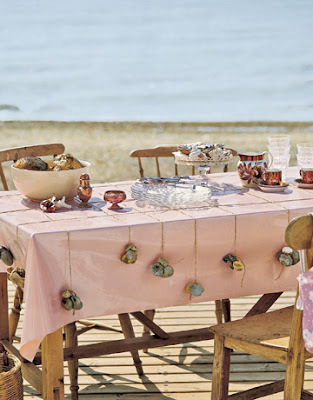 I LOVE the table decorated with shells! We too collect shells at our beach vacation every year. On June 1st every year we get out our ever expanding collection of shells and fill big glass vases and bowls with them. We put them all around the house to signal the start of summer! It is one of my son's favorite "start to summer" activities. In August we put them all away before the school year begins. I love the table shell decor! It looks great and would make the perfect decor for a summer party! When we were younger my mom, sister, and I would clean them and then paint them and make Christmas decorations. I still have some of the sand dollars I painted! I love the glass containers idea! I may have to steal that for my centerpiece in our kitchen. Great post! I love them in the hurricanes! I would love those on my deck table surrounding a tealight candle. So pretty! I LOVE collecting shells. I have them in jars all over. I have 3 jars right now on our dining room table filled with sand shells and candles. Love decorating with shells.